Krishna Residency is a collection of luxury and comfort to provide a truly sophisticated lifestyle by S.P Construction Group. These Residential Apartments are beautifully planned and structured on 1.06 acres of land keeping in mind the architecture of the project. It covers area of 215 Square feet – 327 Square feet with rates starting from 14 lacs onwards and goes upto 23 lacs.Krishna Residency is well planned and executed with quality products at an affordable price. S.P Krishna Residency presents 1 BHK & 1 RK apartments that are finely crafted and committed to provide houses with unmatched quality. The project is presenting total 3 towers on 1.06 acres of area, where each towers will have 7 floorswith total 185 units of different sizes. The Apartments are spacious, well ventilated and Vastu compliant. 1 RK flats carpet area ranging from 215 sq.ft to 265 sq.ft, 1 BHK apartments ranging from 266 sq.ft to 327 sq.ft of carpet area. Khopoli is a well-developed locality in Thane, Mumbai. Krishna Residency project is strategically located just opposite to LowjeeRailway station Khopoli. * For the fun-filled experience, the project is within 9 kilometers from ImagicaAdlabs biggest the theme park. * 15 minutes drive from Lonavala Hill stations. * For the transportation and convenience there is 1.2km NMMT and Khopoli ST bus stop. * 35 Kms from PropNavi Mumbai International Airport. * 40 Kms from JNPT Port. 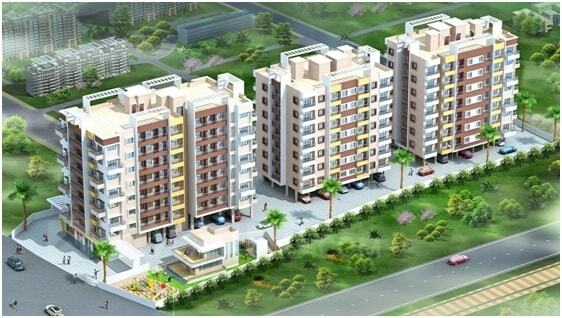 Krishna Residency project is opposite to Lowjee Railway Station, Khopoli, Thane. Krishna Residency is structured with all the necessary amenities such as Lift, Car Parking, 24Hr Backup Electricity, Security and 24Hr Water Supply, Landscaped Garden, CCTV Cameras, Play Area and much more. Schools/Colleges : -Gurukul School, Pillai College of Engineering New English Kamothe School, New Horizon Public School, MGM College of Engineering. Shopping Malls:-Central Plaza, Samuels Mall, Central Plaza, RD Fashion Collection, Alaina city plaza. Movie Theatres: - Gold Cinema, Samuel Cinema. Restaurants: -Swanand Hotel, Sagar Plaza Hotel, Deepak Hotel, Celebration Family Restaurant, McDonald's, KFC, Subways sandwiches, NisargaDhaba. Bank/ATMs: -Hdfc Bank ATM, State Bank of India ATM, Axis Bank ATM, IDBI ATM, Bank Of Maharashtra ATM, Bank of Baroda ATM. Bus Stops: -Khopoli City (KMT) Bus Stand, State Transport Bus Halt, Khopoli Bus Station, Jagdish Nagar, ShilPhata Bus Stop. 231 sq.ft. - 580 sq.ft. 239 sq.ft. - 439 sq.ft.